I wasn’t sure if I was going to have anything to show you for the WIP post today. I’ve been doing a lot of knitting, but I almost thought I would be done with the project I was working on… which would make it an FO, and not WIP. Anyway, I didn’t finish it yet, so here is Wrenna! I’d guess I’m about halfway done with it. I would also guess that I’ll be done with it by the end of this weekend. (Maybe sooner, depending on how much time I spend with it.) But I’m this far now, and I only started it on Saturday. 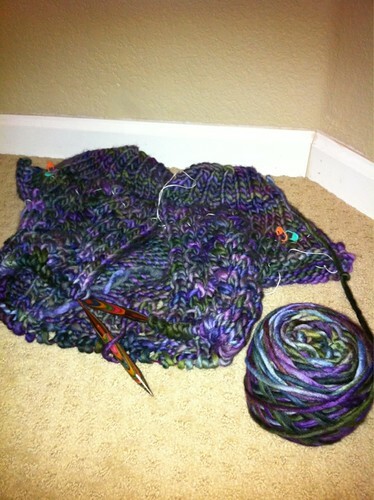 Ah, the wonders of chunky yarn and a size US 17 needle! Previous Post FO: Bitty Bunnies! 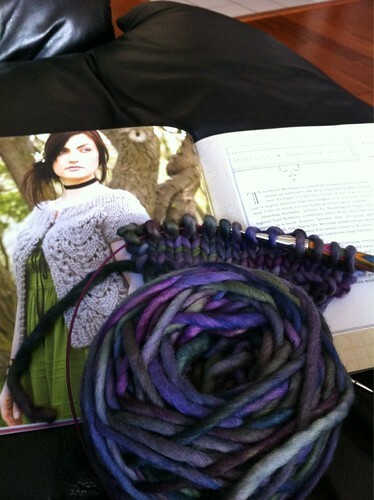 Nicole- Gotta love chunky yarn- it will look fab on you. Oooh I love Rasta! You picked a great shade! Can’t wait to see it done!